The Visual Science Lab / Kirk Tuck: Why, with the right body, Samsung may be a strong and stealthy competitor in the mirrorless space. Why, with the right body, Samsung may be a strong and stealthy competitor in the mirrorless space. Samsung 85mm 1.4 on the NX 300 Body. Full disclosure: I have received a Samsung NX 300 camera with a kit lens and a 30mm f2.0 lens from Samsung to shoot and test, indefinitely. 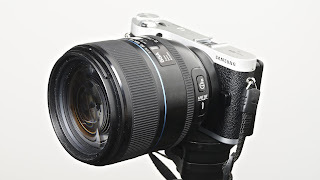 I am also getting the new Samsung Galaxy NX camera and kit lens in the next few days to evaluate. Samsung has also invited me to Berlin for the IFA show and will be my hosts there. I'll be shooting and testing the camera in Berlin and posting images and observations about the camera, its new technologies and its more standard camera handling characteristics. The policy of VSL is to be totally transparent about relationships with camera makers, their public relations agencies and everyone else. You should know what the relationship between a writer and a manufacturer is before you read a blog about a product! While I would never write anything untruthful or knowingly slanted about a product I might also never have had the product show up on my radar without being approached by the maker. I really like the Sony Nex system but could any manufacturer have been slower about introducing the lenses that enthusiasts and pros really, really want? I'm a portrait photographer and I've been waiting for a 60, 70 or 85mm fast lens in that system since I bought my first Nex-7. The 50mm just isn't long enough and the zooms just aren't fast enough. The situation is better in the Olympus and Panasonic camp with the 75mm f1.8 and the fast zooms are finally starting to arrive. But I'd prefer fast glass and a great APS-C sized sensor. I've be faithful to my Sony DSLT system precisely because I really, really like long, fast lenses. I like the look and feel of the 85mm 1.4 and the 100 macro. I'm partial to the look of the 135mm 1.8 on a full frame sensor. I like the look of the 70-200mm G lens. I figured I'd just keep two Sony systems going at once and play with their strengths as needed. Then I got a Samsung NX300. It's got a great sensor but I'm not totally happy with the idea of no EVF. 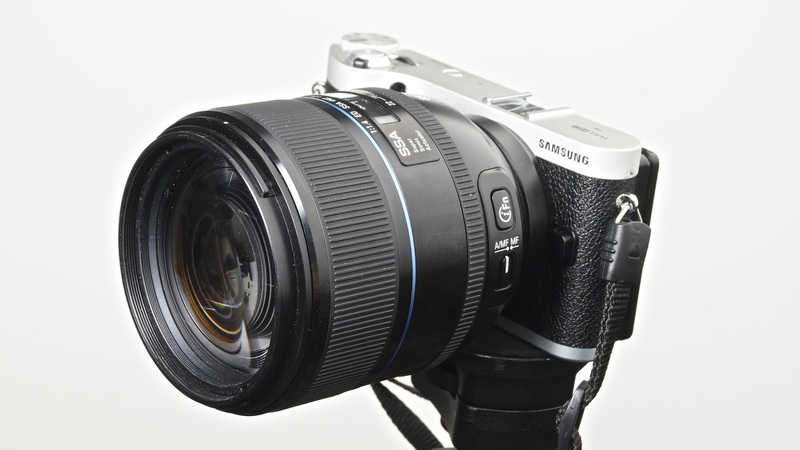 Recently, Samsung offered to send me a Galaxy NX Android to shoot and test. It all sounded great but I must have sounded a bit churlish when I called back and asked/suggested that they would be smart to send me some more interesting lenses to shoot with beyond the kit lens. They took me seriously and sent me a few. All of them are good. But two of them, for my work, are stunning and exactly what I'd been wishing for in lenses for an APS-C mirrorless camera system. The two lenses that leapt out at me are the 85mm 1.4 and the 60mm Macro f2.0. I haven't had time to shoot with the 60mm yet but I've shot some tests with the 85mm and find it to be very sharp, wide open, and a really good performer. I can hardly wait to bolt it onto the front of the new camera with its EVF. The 85mm is big and bulky but there's not a lot you can do to transform the laws of physics. If you want a fast lens you'll need a lot of glass and a big front element. This lens has both. This lens is a prime example of why Samsung may succeed in the mirrorless market. They are actually providing the stuff shooters want: good glass. They've introduced a 16mm 2.4 that blows the doors off the Sony 16mm. They have a killer 30mm f2. The kit zoom is, in my opinion, the best of the breed. They make a 45mm 1.8 that's been well reviewed. Then there's the very fast 60mm f2.0 macro I alluded to above. Along with this stout 85mm 1.4. There's a really useful (but huge) 18-200mm 3.5-5.6 lens that seems designed expressly for making videos and then there is the usual complement of consumer style zoom lenses. In other words Samsung is creating good glass that should help drive a professional and enthusiast market with the eye candy they want and at better price points than their close competitors. But they've still got stuff at less expensive price points for more casual shooters. In my opinion Samsung has the opposite problem, today, of that which Sony has had for the last two years: Sony made a great camera body (the Nex 7) and followed up with another great and less expensive body at a good price point (the Nex 6). But where they stumbled was in the lens category. The 16mm sucked on the 7 and the kit lens had it's share of issues on the high density sensor. While the 50mm 1.8 lens is very good there was nothing in the longer/faster category. One Zeiss 24mm doesn't make a system...especially for a portrait guy. Samsung has the lenses I want and at prices that I can justify but they need to make a few changes to the range of camera bodies. While I realize I don't represent the entire market demographic for cameras I'm pretty adamant that they need to incorporate eye level viewfinders in every camera aimed at pros and people who love to shoot outdoor images. As a compromise I am A-okay with add on finders. The newest body, the Galaxy NX Android has an EVF and I can hardly wait to test it. But they need a compact shooter's body, like the NX 300 but with the ability to use an EVF if they are to compete head to head in the space with the EP-5 from Olympus and whatever the next iteration of the Nex-7 is. I am a bit frustrated with the NX 300. It's got a great sensor, a great body, fast focusing and a bevy of nice features but it would be an absolute no brainer if it had a matched 2.44 megapixel EVF you could put into the hot shoe. That, and a microphone input. Kirk, I am following your experiences closely here. I hadn't realized Samsung had (so quietly?) come out with the fast glass you listed. 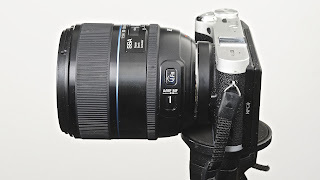 Regarding Sony NEX6, I share your frustraton here as I have only the 16-50 kit. Nothing else has excited me. But I did just preorder the newly introduced Zeiss 16-70 for E-mount. I am hoping it makes me at least as happy as the 14-54II on my EM5. It certainly will focus faster. The 16-70 is a big move in the right direction. I'd love to see Sony come out with a 70mm f2.0 just like Olympus did in their Pen system in the late 1960's... How hard could it be? 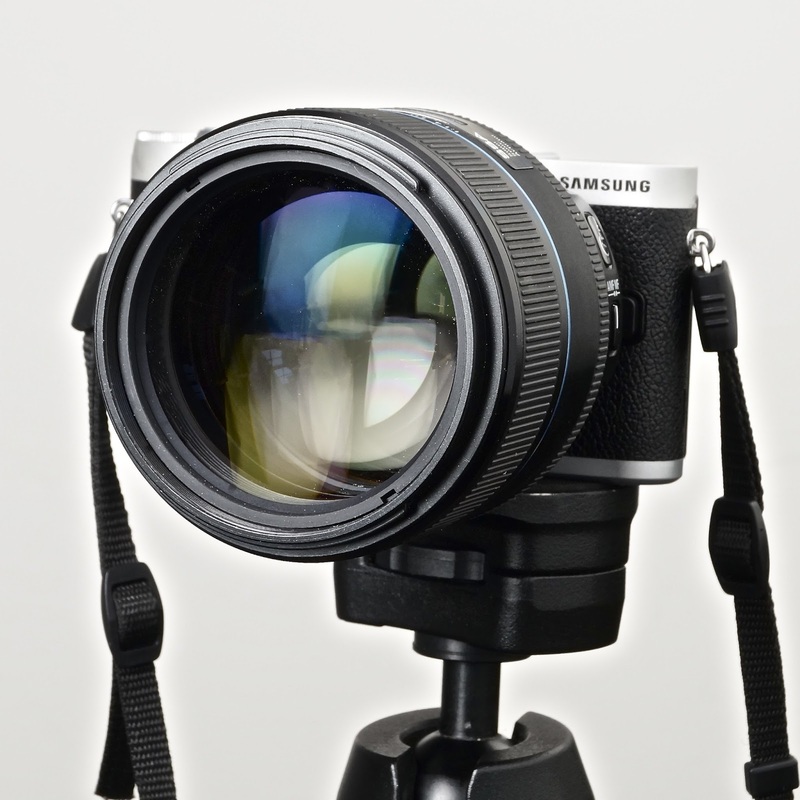 I would like to see Samsung introduce an EVF version of the NX300. The size of the Galaxy NX due to the large capacitance screen that showcases Android is too much of a penalty. Incorporate focus peaking and it would be a very worthy, possibly superior, competitor to the NEX and others. The NX flange distance is short enough to allow most legacy SLR lenses to mount. The only issue is with Leica lenses. The NX flange distance is 25.5mm and the Leica M and screw mount flange distance is 27.8 and 28.8mm. It would depend upon the diameter of the lens mount as to the practical fabrication of adapters for Leica mount lenses. I disagree about the size only because I've never found smaller cameras to be as easy to hold steady. 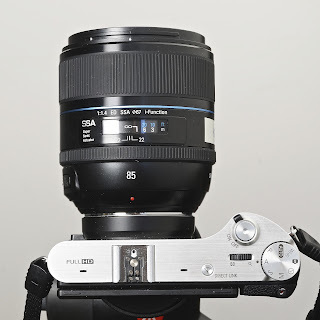 The NX 300 already incorporates focus peaking. Kirk - odd how Sony and Samsung are opposites at this point, isn't it? Also, that 85 is even larger than I imagined on the NX300. My feeling about Samsung is that, lacking a history in the photography business, they tend to make odd choices on focal lengths (also, their crop factor seems to be 1.54 for some odd reason). For a fast portrait lens that doesn't overwhelm the camera body, they should really be doing a 60mm f/1.4 instead of the monstrous 85 (nice as it may be), and/or a 90mm f/2 (or f/1.8) for a longer option. The 30mm may be nice, but I can't help but feel that it should be a 33mm to hit closer to 50mm equivalent fov. Their 20-50 zoom is an odd duck - who shoots with a 30-80mm equivalent? I have no idea what their 45mm 2D/3D lens is supposed to be, and their 20mm should be 23mm to hit 35mm equivalent. Photographers are used to the look of particular FOVs, and the fact that Samsung's lenses are all over the place (either too short or too long, very rarely 'just right') doesn't inspire confidence that they actually understand photographers. It speaks well of current management that they are working with people like you, but they'll still need to listen and follow through. Thanks for your continued reviews and essays. To be honest, when I look at this, I cannot help but think about my D700 with the 80 1.8 G lens mounted on it. I mean, like everyone else, I have been attracted to mirror-less, in no small part, because of size considerations; in reality, although it is larger, the D700 is not that large. When I mount the 80 1.8 G to my V1, something in the back of my mind is always there asking: What are you doing? What's the point? In this neck of the woods its hard to find a dealer who stocks Sony. Panasonic and Olympus are virtually non existent, and Samsung well None of the stores I frequent stocks them. The kit looks nice, but until it hits the shops it ain't going to sell. The thing that amazes me is the price of that 85/1.4. It's $800 versus $1400 for the same lens for a Sony or Nikon DSLR/SLT. (I'd rather knock it back to f/1.8 or f/2 for compactness ... or even go with a 70/2, but 85 on APS-C is great - I've been shooting one on my DSLRs for several years now). But you're completely right - it's not even worth looking at, for me (since I'd have to pay for it ;) until there's a decent body to put it on. (And I don't think the Galaxy NX is going to be it, though I'll be looking forward to your upcoming thoughts on it). Ouch ! OK, so the 85/1.4 might look like a steal at $800. But I just over on dpreview that Samsung has announced pricing on the Galaxy NX at $1600 body only. I'm no longer interested in anyone's thoughts on it ! (Not a question of affording it; I've spent plenty of money on gear, but there are too many other cameras available for far less money that are going to be every bit as good or better, minus Android). Although the lenses are not branded as such, I wouldn't be surprised if many Samsung lenses are designed by Schneider Kreuznach. Not exactly a club of idiots, which explains goes to explain the exceptional IQ of many of these lenses. Assembly may be done by either Samyang or Samsung themselves. Whatever the case, Samsung has great glass, and offers a good selection too. And the prices are right, too. What more can one wish for? Gearwise, it's a exciting time to be a photographer. "which explains goes to explain" should be "goes to explain" of course. Apologies for the typos. Kirk - from your previous articles on the Samsung cameras I'm not sure whether or not you're aware of the existing (non Galaxy) cameras they already offer with EVFs (for example - http://www.samsung.com/uk/consumer/smart-camera-camcorder/cameras/nx/EV-NX20ZZBSBGB). Perhaps you could also try one of these as an alternative to the Galaxy version you have on the way? Very nice lens but may I ask what exactly is the advantage of going mirrorless once you put that kind of lens on the camera? I'd rather go with the Nikon or Canon offerings which I don't believe being much worst nor much larger and ah, if one doesn't mind them being a bit slower the f1.8 versions are also 40% cheaper. Still I agree that Samsung is almost getting there and once they fix the few flaws it can be a nice choice for smaller lenses. Kirk, thank you for your observations. But I believe Samsung's macro lens is 60mm f/2.8, not f/2.0. It's a great lens though. I'll be really curious to hear about your experience with the Galaxy NX. It is great that it has an EVF, but there are few controls on the camera besides the touchscreen. Unless I'm missing something (which could very well be having never seen or held one myself), it seems awkward to make settings adjustments with the camera to your eye. I'm also weary of a camera that takes apps - only because how unresponsive my phone gets when I load it up with apps! The battery seems to have 3 times more capacity than my Olympus, though, which is a good thing. From 1001 Noisy Cameras Blog: Samsung went off the wall today with a rather unusually high price for their new Galaxy NX interchangeable lens mirrorless camera phone creature. It will go for $1,600 body only or $1,700 with the kit lens. Not a typo. One thousand six hundred US dollars. 2013 dollars, not 3013 dollars! The book has opened and then closed very quickly on this story. Seems similar to the Sigma SD-1 release at $6k or so, followed by no sales, followed by rebadging as Merrill version and MASSIVE price reduction. This may be an interesting camera, but best bought at closeout prices a year from now (like the Nikon V1 or Canon M). It is NOT a $1.6k body only camera. Rick Baumhauer feels that the focal lengths are odd. I disagree, a few mm isn't much of a difference in framing, so 20 vs. 23 doesn't matter much. The 45 is going for ~70. Really, most, even most pro photographers aren't so in tune with the focal length of their lens that they shoot without looking through the viewfinder, so you see your framing, and a step forward or back isn't a big deal, they were having to do that to get the right framing before anyway. Fact of the matter is, it's not really important to match standard focal lengths exactly, just to have offering in those ranges. Even among the big players in photography there is roughly a 10mm range in the "50mm" category. That's 20% variance, if it was anywhere close to important to have exactly the same FOV that wouldn't have happened.